Paxton was lucky to have Ole Herstedt, and Tim Holzfaster knew it. Paxton seemed like an exotic, macho paradise to Carl Weihe when he was a boy in the 1940’s. 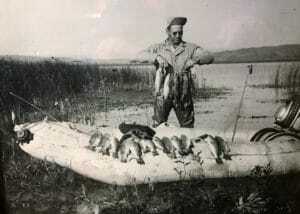 He hunted every autumn along the South Platte from the age if eight until his dad died in a plane crash in 1951. He remembers waterfowl so thick they blackened the skies, slabs of meat served by the happy-go-lucky bartender named Ole, lipstick ladies, and a tiny, dusty town that never seemed to sleep when the hunters and ducks met on their fall migrations. Interstate 80 now connects Paxton to the world. The biggest business in town, Titian industries, specializes in perforated plastic pipe for well casings. But the highway and Titian’s were not even pipe dreams 60 years ago. The little Keith County town survived on trade from farmers and ranchers. In the fall, the stores and nightspots got an extra boost from hunters like the Weihes, a true outdoors family. Weihe will never forget that first duck. But what he really remembers about Paxton is a bar operated by an adventurous man named Rosser “Ole” Herstedt. The bar’s name, of course, was Ole’s. Rosser’s would have sounded like a dress shop and Herstedt’s like a department store. According to local lore, Ole was a great athlete. He was visiting a friend in Julesburg, Colo., who persuaded him to pitch a game against their archival, Holyoke. The Julesburg players promised Ole $50, if they won the game. Win they did, but nobody could scrape up $50. So his friend gave the Nebraska hero a walnut bar that had been crafted for the Plains Hotel in Cheyenne, Wyo. Shortly after Ole won the ball game and the bar, rumors began circulating that prohibition might come to an end. Ole’s parents owned a building on Paxton’s main street. With a building and a fancy walnut bar, he knew he had an advantage over the competition. Prohibition ended on August 8 of that year and Ole opened for business after midnight. Ole worked hard. With help from his mother, Hattie, he ran a good bar. Most of his customers were men, real men. Some of the current waitresses say they were not allowed to go anywhere near the place in the early days. The bar really came alive during hunting season. Ducks, geese, pheasants and quail were plentiful. Fishing was catching on at Lake McConaughy. After a day afield, in the river, or lake, many of the men returned to Ole’s for a night of card playing, bartending and storytelling. Ole worked long hours to feed and provide drink for the town’s guests. But he always left time for hunting. 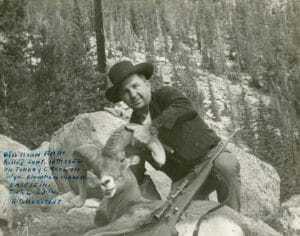 In 1938, he bagged a big white tail buck and hung the mount in the bar. Nobody could have suspected where that would lead. Over the next few years, Ole embarked on a hobby of big game hunting that took him to every continent. For 35 years, he brought his trophy mounts home and hung them above the bar tables and booths. A moose from Canada came to Paxton; a black bear from Alaska; a red fox from England; even a python from Honduras. 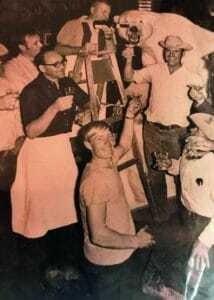 Eventually, over 200 trophies were on display, and Ole’s Bar became one of the most unusual farm town taverns in America. In 1969, Ole shot a polar bear on Russia’s Chukchi Sea while hunting on a 70-acre ice flow. A full mount of the huge white bear was brought back to the bar and put on display just inside the door. Within four years of that hunt Ole quit his hunting trips. But he continued to run the bar until he was in his late eighties. Word spread about the little town with the unusual bar. Motorists exited nearby Interstate 80 to take a look. Ole enjoyed the travelers and was always willing to tell stories between sips of his favorite drink, VO and Coke. One of the charms of Ole’s Bar was the surprise visitors. 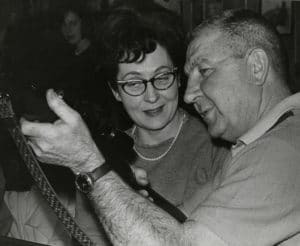 Ole had visited Jack Dempsey’s restaurant in New York, and on several occasions the retired boxer came to Paxton to hunt, fish and pal around with his Nebraska friend. Actor Robert Duvall, Gunsmoke’s Miss Kitty and other notables also came to see the unusual bar and the man behind it. If you could have chosen from all the people who lived in Paxton in the middle years of the 20th century, among the most unlikely to create a tourism attraction for the town was Ole Herstedt. He was likeable rouge, a nice fellow who enjoyed a good time. But certainly he was not a poster boy for the Commercial Club, or a candidate for economic development leader of the year. Perhaps that was the charm. Americans like colorful characters. The sportsman (and the occasional sportswoman) who stumbled upon the Paxton bar probably saw in Ole what they wished for themselves- a person lucky and smart enough to parlay his joy for the outdoors into a livelihood. Even people who never fired a gun understood that Herstedt was a rare help of planners and decorators, one wonders if it could have been a success. Take a walk through Ole’s and you know there was no planning. The bar probably couldn’t have succeeded in New York City, Chicago or Boston. Yet it works in Paxton, of all places. In 1988, when he was 87, Ole decided he’d had enough. 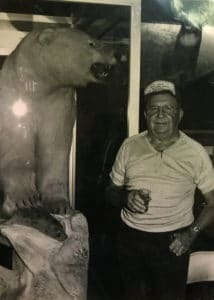 He hoped to keep the bar and trophy collection in Paxton, but when no one expressed interest in buying the operation, he made arrangements to close the bar and sell the mounts to the Springs family of Myrtle Beach, S.C. 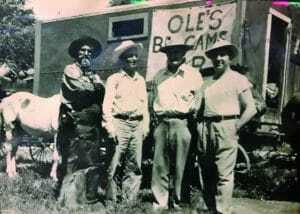 The Springs were Ole’s longtime friends. 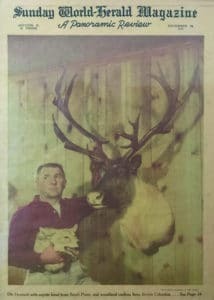 They hunted and fished several times a year in the area, and they intended to start a bar and steakhouse for the sole purpose of displaying Ole’s collection. Construction plans were already underway in Myrtle Beach. Meanwhile, back in Paxton, realtors were measuring the bar building to list it for sale. It seemed that Ole’s, a Nebraska tradition, was ending. But Tim Holzfaster, a 28-year-old Paxton native, born and raised on a farm south of town, learned about the plans to dissolve the business and called to ask if it were true. “He told me he couldn’t find anybody local to buy the business.” Tim said. Before the conversation was over Holzfaster told the old barkeeper he would buy the building and the collection and figure a way to keep it in Paxton. The Springs of South Carolina said the collection belonged in Paxton if it were possible, and agreed to wait for the youngster to come up with a business plan. A few weeks later, Holzfaster became only the second owner of the business in 53 years. Holzfaster comes from a religious background; one of his first stops was his grandparent’s home, where he promised them that the new Ole’s would have a family atmosphere. So how did the new owner change the outdoorsman’s hangout into a place where moms and dads would bring their kids? The polar bear stayed. So did the Canadian moose and Ole’s 200 other trophies. 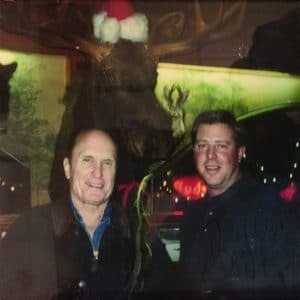 But Holzfaster, with the aid of his wife, Deb, gave the place a thorough cleaning, aired it out, and the ordered Nebraska beef from Mark Hehnke, a third generation butcher who has a shop a block north of the bar. The walnut bar Ole won in the baseball game still spans the east wall. Several large photos of scantily clad Marilyn Monroe hang above it. The late starlet is gazing over at the jack-a-lopes. Even Ole continued to hang around the place almost right up until he died at age 95 in 1996. Holzfaster was determined from the start not to let Ole’s Bar become what he terms “touristy,” so he doesn’t fix every rip in the upholstery. A few of the tables might rock just a little when you sit down. “There’s nothing fancy about Ole’s,” he said. “We just try to provide good food and good service.” Proof of that lies with the local people including women and children these days- who are as likely to be seated under a five-point white tail as a family from Omaha or a Kirby salesman from Kalamazoo, Mich., who heard about Ole’s from a lady who bought a vacuum cleaner. “We have a national and international following, but the success of Ole’s is because of the local patrons who live and work around here, and the Nebraskans from father away who make it a habit to pull in,” Holzfaster said. Some customers have been stopping since the time when Ole was cleaning his shotgun at the bar. But others are starting new traditions, like St. Mary’s High School in Omaha, which stops by every year on a ski trip to Colorado. The principle always calls ahead, which gives Holzfaster time to take down the Marilyn Monroe pinups. They are actually quite modest. But Holzfaster is a cautious proprietor who balances the history of Ole’s Bar and Paxton’s sometimes raucous past with modern-day sensitivities. Swede tended bar on main street for many years alongside his friend, Ole, Said Holzfaster. “The name should stay as Swede’s because that means a lot here Paxton.” Holzfaster retained much of the old décor and furnishings of both Swede’s and the Cheetah, but he opened walls between the three side-by-side lounges, which greatly expands Ole’s seating capacity. He also restored a big dance hall above Swede’s for prom parties, wedding dances, banquets and meetings. The man who saved Ole’s from moving to South Carolina typically works 12 hour days, but he and his wife Deb, who does the books for the business, have three youngsters, so he usually skips out in the afternoon and returns to help with the dinner rush. Ole’s is open 364 days a year, every day except Christmas. Holzfaster isn’t able to travel like his predecessor, but he does get away. He recently returned from South Carolina, where he visited the Springs. They continue to be customers and friends of the Ole’s crowd in Nebraska. He also enjoys an occasional hunting trip around Paxton. Ole didn’t hunt for Holzfaster. In fact, it was the kid who set his sights on Ole’s bar. But the old man must have liked what he saw when the farm boy took an interest in his life’s work. Maybe Holzfaster’s stature (he stands 6’2”) made Ole a believer. Whatever it was, the old man must have been especially tickled by the time he died in 1996, eight years after the sale took place, because the steakhouse was drawing hundreds of diners each day. Judging buy the comments jotted in a guest book that lies beside the polar bear, travelers are still charmed by the rustic Paxton bar. “Beer, gizzards and nuts. Heaven!” wrote a man from Tucson, Arizona. “Great food,” added a Minnesotan. “What do the animal rights activists have to say?” “Damn good Bloody Mary’s and chicken soup,” added a Des Moines diner. 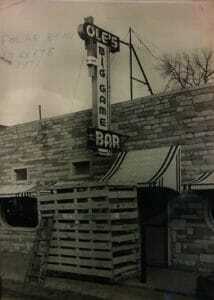 Ole’s Bar could have never survived, planned or unplanned, in a thousand other towns or cities in America. Yet it is one of the most successful restaurants and tourist stops in the state of Nebraska. On a busy day, hundreds of meals are served beneath the glassy eyes of the animals. America’s hunting tradition and our love for the land must be part of the explanation for the unusual steakhouse. But why Paxton? Two reasons: Ole Herstedt, the rough-and-ready baseball pitcher who got it all started in the 1930’s, and Tim Holzfaster, his relief man.